Some of my clients with Hashimoto’s have reported adverse reactions to various supplements, in addition to an increasing list of food and environmental allergies. Addressing your gut health and any underlying deficiencies can help many people, but what if you find yourself reacting to recommended protocols that are supposed to help you? Investing in some supplements only to discover you are sensitive or reacting to them may be discouraging. You may even be scared to try a new intervention in case you have an adverse reaction to it. But don’t throw in the towel — there’s a way to address this hypersensitivity and reclaim your healthy self! An accumulation of toxic buildup over time can result in an overburdened detoxification system that may show signs of stress. Oftentimes, clients may find that supporting the liver makes a significant difference in their well-being and can improve many of their other symptoms too. So, the first step to being a “liver” of life again may just lie in supporting the liver. The liver is an important organ that is responsible for a multitude of processes: it filters the blood, stores glucose for energy, produces and secretes bile for fat digestion, and is necessary for converting T4 to the active T3 hormone. It’s also our primary detoxification organ. The liver has two pathways for detoxification. The elimination of toxins is done through a two-step enzymatic process. In the first step (known as Phase I), fat-soluble toxins undergo processes such as oxidation, reduction, hydrolysis, hydration, and dehalogenation. This pathway requires B vitamins, folate, glutathione, and flavonoids. The toxins are metabolized into intermediary substances that make them easier to process as they move along and prepare for the next phase. In the second step (known as Phase II), the substances undergo conjugation, sulfation, glucuronidation, glutathione conjugation, acetylation, amino acid conjugation, and methylation reactions. These processes detoxify the substances and make them water-soluble so they can be excreted via the stool or urine. Folate, magnesium, glutathione, vitamin C, B5, B12, and the amino acids methionine, cysteine, glycine, taurine, glutamine, and choline are needed in Phase II. However, when the office worker keeps getting more and more paperwork dumped on her desk without replenishing the tools she needs to complete her work, a backlog can occur. A similar situation happens with our liver and toxins. Our detox pathways may become overwhelmed and overburdened, and we end up with a toxic backlog. Toxins may build up and circulate in our bodies or become stored in our fat instead of being properly excreted. This often results in multiple symptoms, as well as reactions to substances that are normally harmless… Imagine asking an overworked colleague for a small favor — there’s a chance she may snap at you — or it may take her way too long to do something that should take a minute or two. Symptoms of toxic overload may include digestive problems, bad breath, fatigue, weakness, constipation, headaches, hormonal imbalance, itchy skin, rashes, breakouts, joint pain, brain fog, irritability, chemical sensitivity, and weight loss resistance — just to name a few! Your liver may also show signs of stress in the form of right-sided chest pain, gas, and diarrhea. Liver Impairment and Thyroid Disease: How is it related to Hashimoto’s? Some Hashimoto’s patients with a sluggish liver may also notice an extreme sensitivity to foods and drugs. Many of my clients who have reported chemical sensitivities and allergies to different foods and medications would frequently react to just about any benign and helpful supplement that I would give them. These reactions are often due to the toxic backlog that is present in their body, which can cause them to react to everything in their environment as well. How could I be allergic to this cute face? I personally know how miserable this can feel. 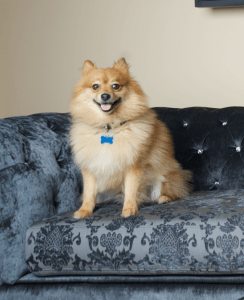 When I started my journey with Hashimoto’s just after getting married in my 20’s, I started becoming to allergic to EVERYTHING, both indoor and outdoor — including my Pomeranian Boomer and all the trees in California! My allergies were so awful, I was dependent on eye drops and antihistamines 24/7. Furthermore, right after getting married to the love of my life, I discovered I was allergic to our bed and couldn’t sleep on it! I was miserable and felt like I was falling apart. At that time, I didn’t know that having all those toxins on board was actually delaying my healing. I like to say that we are the canaries in the coal mines, and our symptoms are the signs of the invisible dangers surrounding us. Unfortunately, escaping toxins in our environment can be challenging — they’re everywhere! In fact, in 2006, the Centers for Disease Control reported that the average American has 116 out of 148 synthetic compounds in their body! Whatever we inhale, ingest, and absorb into our skin eventually ends up circulating in our body. 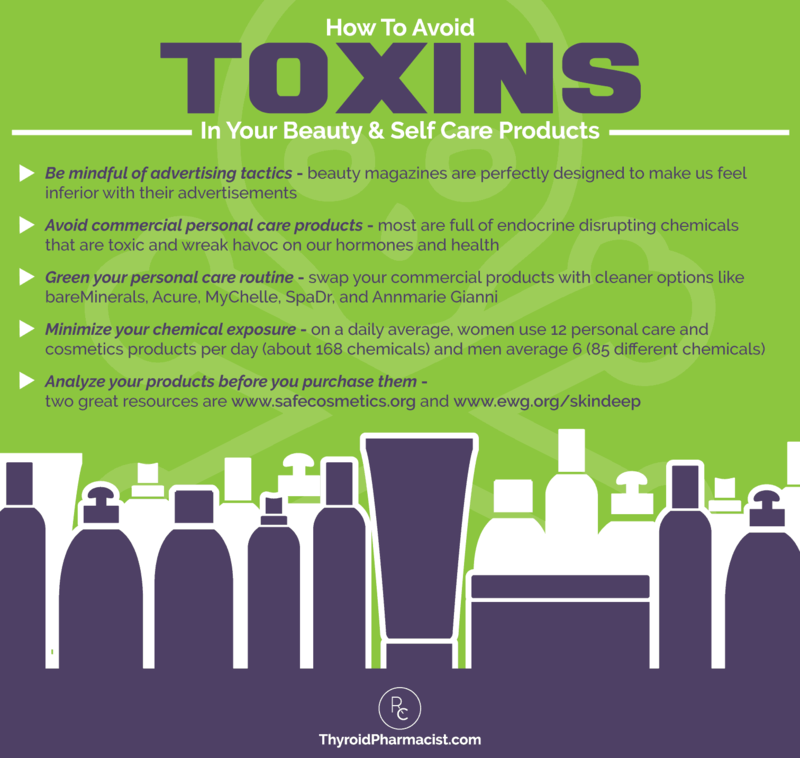 From our cosmetics and skin products to pesticides and exhaust fumes, we’re exposed to thousands of chemicals a day — many of which are especially detrimental to our thyroid health. Xenoestrogens such as BPA, soy, phthalates, and parabens, for example, are chemicals that mimic the effect of estrogen. These chemicals may increase TSH and perpetuate the autoimmune attack on the thyroid. BPA, found in plastic containers and even store receipts, antagonizes T3 receptors in the thyroid. Xenoestrogens can be found in personal care products, plastics, and foods. Triclosan, found in antibacterial soaps, toothpaste, deodorants, and hair sprays, has a structure that resembles that of thyroid hormones and has recently been banned by the FDA due to thyroid toxicity. Fluoride is another halogen that can wreak havoc on the thyroid. Common sources of fluoride include supplements, bottled beverages, toothpaste, black and red tea, canned foods, chewing tobacco, black/red rock salt, and certain medications. Fluoride has been added to most water supplies in the United States, Canada, and some parts of the UK to prevent dental decay. However, it is also an endocrine disruptor. Although fluoride was actually used to treat hyperthyroidism up until the 1950s as it is an effective thyroid suppressor at daily doses of 0.9 to 4.2 mg, studies confirm that most adults in fluoridated communities ingest between 1.6 and 6.6 mg of fluoride a day, effectively suppressing their thyroid function. Some people may never be exposed to heavy toxins but may have the perfect storm of vulnerabilities that may lead to a greater accumulation of toxins and put them at a greater risk of having an overburdened liver. For example, some people may have the MTHFR gene mutation that elevates their homocysteine levels. Elevated homocysteine levels have been associated with difficult pregnancies or miscarriages, birth defects, inflammation, and heart disease. Individuals with the MTHFR gene variation may also have a difficult time processing folic acid (a manufactured version of folate that is present in low-quality multivitamins and added to processed foods). Moreover, they are more likely to be deficient in folate, B6, and B12 and may require activated versions of these nutrients to address these deficiencies. The MTHFR gene mutation also prevents people from properly methylating, which is one of the body’s key detox processes. Methylation impairment can result in a liver that needs a little extra help when it comes to clearing out heavy metals from their body. The gaps in the gut allow for irritating molecules and substances to “leak” into the bloodstream. A leaky gut can result in the absorption of potentially problematic substances and lead to impaired detox abilities. Additionally, the decreased ability to sweat, which can be common in those with hypothyroidism (and a great “perk” of thyroid disease in social settings ;-)), can make you more prone to liver congestion. Gluten intolerance, low HCl levels, and other absorption issues present in Hashimoto’s can also prevent us from properly absorbing nutrients needed for our detoxification pathways. Finally, food sensitivities, which are particularly common among those with Hashimoto’s, can contribute to liver congestion. When you continually ingest the proteins of foods that you are sensitive to, you could develop antibodies to them. Reactive food proteins can attach to these antibodies, creating what’s referred to as circulating immune complexes (CICs). When the body becomes overwhelmed by too many CICs, the complexes accumulate in the liver, leading to impaired liver function. So, those with Hashimoto’s are especially more likely to develop a chemical backlog in their body! I’ve discovered that people who do not begin with liver support (and instead start with addressing the gut or adrenals, or taking supplements in general) are more likely to react to medications, supplements, and even foods. Supporting the liver can really kick-start your healing and even make you feel brighter, happier, and more alive. You may have heard about intensive “detox” strategies such as taking high dose iodine, coffee enemas, or chelating agents like spirulina, chlorella or DMSA. However, “forceful” detox methods may, in fact, be potentially harmful to your health and lead to serious consequences. High doses of iodine, for example, can cause increased thyroid gland destruction. Meanwhile, coffee enemas may result in perforated bowels or colitis when people don’t perform them correctly, or have an adverse reaction to the coffee. Unfortunately, I’ve had clients who had to be hospitalized due to coffee-induced colitis, resulting in inflammation of the inner lining of the colon. Chelation is another popular and “powerful” detox method. It causes the metals to detach from your body and allows them to start moving freely around it. Unfortunately, “powerful” doesn’t always mean “effective”! If you can’t get rid of these metals via the liver, they are just going to circulate and attach themselves to other types of body tissues — which could be problematic and potentially make you feel even worse. I learned this the hard way – I once tried a “forceful” detox with spirulina, which led to the development of a new autoimmune condition called giant papillary conjunctivitis. This resulted in giant pimples on the inside of my eyelids, and yes, it was as awful as it sounds! Don’t make the same mistake I did! Furthermore, forceful strategies can make those with autoimmune thyroid disease feel worse — especially when done without medical intervention — as aggressively drawing out toxins can overwhelm the detox pathways that are already overburdened due to Hashimoto’s. I can’t stress enough the importance of being gentle on the liver. I don’t recommend “intensive” and potentially dangerous detox interventions until you’ve had your liver properly supported, your adrenals balanced, your nutrients supported, and your gut function restored (as covered by the Fundamental Protocols of my book, Hashimoto’s Protocol). When it comes to healing, being gentle and putting safety first is key. Natural Treatment Options: What is liver support? How can it help you? I like to utilize natural protocols to support the liver and detox pathways, so this is where liver support comes into play. Liver support is different from detox and can help a person feel better in as little as two weeks. It is one of the things I recommend for everybody with Hashimoto’s, especially those who report severe issues with allergies, have a lot of breakouts, and score really high on toxicity level tests. When people have a lot of reactions to different supplements, it’s usually a liver issue. I would recommend supporting your liver by following the Two-Week Liver Support Protocol in my book, Hashimoto’s Protocol. I’ve found that following my 4-step liver support is something that’s going to be helpful for most people, and it really kicks off your healing. 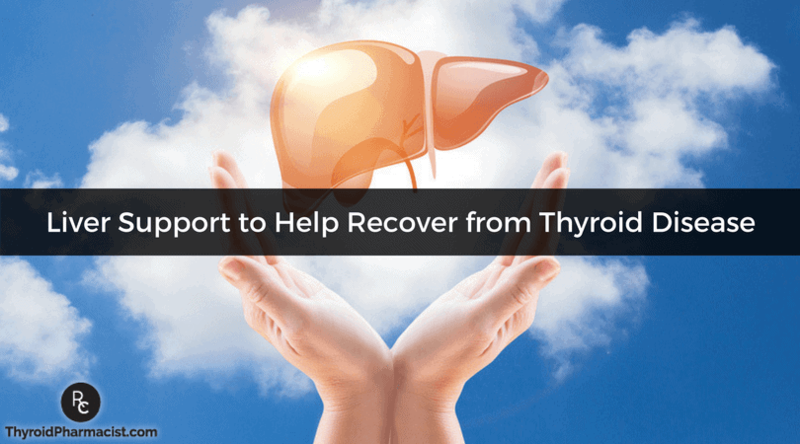 In fact, 65% of people who completed the Liver Support during my Hashimoto’s Self-Management Program – many of whom had been sick for over 10, 15, 20 years – said they felt significantly better after completing the Liver Support Protocol. I loved all of the messages I received from my clients who were able to go to the mall again because they were no longer experiencing multiple chemical sensitivities, became active because their joint pains had reduced, and felt overall more energetic and happier as their many symptoms began to lift. Some benefits of a doing liver support include a reduction of many of your symptoms, as well as clearer skin, improved vitamin and mineral absorption, and better bowel function. As triggers are removed and nutrient deficiencies are addressed, the liver is able to clear out toxins and process hormones more efficiently. This means that estrogen and progesterone levels will be better balanced. Those with thyroid disease will also begin to feel better because as more of the liver enzymes are freed up to work on hormones instead of toxins, the body will have more access to T3. Since the body produces the active T3 hormone through a conversion process from either endogenous T4 that’s produced in the body or exogenous T4 that is taken as a medication, having a healthy liver means that our bodies can utilize our own thyroid hormones, as well as our thyroid medication, much more efficiently! This means more energy, better hair growth, and even effortless weight loss for some! The first thing you should do is remove all the foods that could be causing toxin buildup or are irritating the gut and disrupting nutrient absorption. Triggering foods should be removed from your diet if you have Hashimoto’s regardless if you are doing the Liver Support Protocol because they cause compounding issues. For example, these foods contribute to leaky gut syndrome which, when coupled with Hashimoto’s, can result in confusing symptoms and make it difficult to identify root causes and treatments. If you’ve already removed these foods from your diet, that’s great news! You can skip to step two and begin adding liver-supporting foods. During this Protocol, it’s very important to support your liver because it’s doing a lot of heavy lifting. By introducing the following foods to your diet, you’ll be supporting a gentle and effective detoxification process while adding superfoods to your diet. About an hour after your morning cup of hot lemon water, I recommend making a green smoothie for breakfast in a Vitamix blender. The Root Cause Green Smoothie is nutrient-dense and packed with plenty of protein, fat, and fiber to help you support your body’s detox pathways. Since the smoothie is blended into tiny particles, it’s much easier to digest compared to a regular breakfast, and the nutrients are more readily available so they can fuel your body and help you feel energized throughout the day. You can find my go-to green smoothie recipe here! Adding supportive foods such as cilantro to get rid of heavy metals, and beets, which are rich in folate and betaine which help to break down homocysteine and can be particularly helpful to those with the MTHFR gene mutation, can also aid your body in eliminating toxins. You might be surprised by some of the sources of toxins in our lives today. The problem is that more chemicals are constantly popping up without testing, and it’s hard to know which ones will and will not hurt us. Also, sometimes common products like household cleaning supplies and personal care products are packed with toxins. During the Liver Support Protocol, pay extra attention to every chemical source you encounter throughout the day. Mercury – Mercury is most commonly found in dental fillings and in fish, such as tuna. Mercury is known to interfere with thyroid function, especially in those with Hashimoto’s. Mercury vaporizes when heated, and chewing food can cause mercury to be released from dental fillings into your blood. Removing mercury fillings can reduce Thyroid Peroxidase Antibodies (TPO antibodies) in the blood. Mercury consumption from fish can be controlled by avoiding species with the highest mercury content such as tuna (ahi, bigeye), mackerel (king), and swordfish. I also recommend limiting your intake of species with moderate mercury levels to a couple times a month. These include tuna (yellowfin, canned), mackerel (Spanish, Gulf), and sea bass. Aluminum – Aluminum is found in many cooking pans and antiperspirants. Scratched non-stick pans are a common source of aluminum toxicity, which is why I recommend using stainless steel pans. I also recommend switching to an aluminum-free deodorant. Fluoride – Fluoride is a thyroid-suppressing halogen found in our water, toothpaste, and even black and green tea. A 2015 British study found that medical practices in areas with fluoridated water were twice as likely to have patients with hypothyroidism. I strongly recommend using a reverse osmosis filter to get rid of the fluoride in your water and avoiding toothpaste with fluoride in it. One of the most cost-effective reverse osmosis filters out there is AquaTru’s countertop filter. Other heavy metals: lead, cadmium, cobalt, etc. Beauty Products – The average woman applies an estimated 168 chemicals to her body every single day and many of them are known to contain toxic impurities. This is a staggering number of chemicals we are applying to our skin each day. I love AnnMarie Gianni skin care because they really go the extra mile to ensure the products they create are free of toxins! Please check out my post on beauty products for more information and more non-toxic options. Have you ever walked into a building and just felt off? Sick Building Syndrome is a recently coined term to describe a collection of health symptoms experienced by one or more people due to exposure and time spent within a specific building. This is due to poor indoor air quality that may be caused by various airborne toxins, such as off-gassing building materials, volatile organic compounds (VOC’s), air pathogens, pollens, or molds. This is usually combined with faulty heating, air conditioning and/or ventilation systems. I recommend getting an air purifier for your home (especially your bedroom where you sleep) to clear out airborne toxins. I keep the AirDoctor in my bedroom! MTHFR Pathways – maintains a healthy homocysteine pathway. An optimally functioning homocysteine pathway provides methyl and sulfur groups for biochemical reactions such as detoxification, healthy immune function, brain, and cardiovascular health. Liver Reset – contains a natural pea protein isolate to fuel natural detoxification pathways. It includes the nutrients needed to support and balance phase I and II metabolic pathways, high levels of antioxidants for safe detoxification and a comprehensive array of herbal hepatics and cholagogues to promote healthy liver function and elimination. Liver & Gallbladder Support – a comprehensive formula designed to support bile flow for the normal processing and elimination of toxins through the specific combination of nutrients and herbs in this formula. By supporting liver and gallbladder function, Liver & Gallbladder Support supports the elimination of fatty substances from the liver and the digestion and assimilation of fats and fat-soluble vitamins. Amino Support – useful for preparing the liver for phase II detoxification. Providing nutritional support for phase II detoxification helps conjugate toxins and prepare them for safe elimination from the body. NAC – supports tissue levels of glutathione, a key component of the antioxidant defense system. Magnesium – activates the enzymes necessary for a number of physiological functions, including neuromuscular contractions, cardiac function, and the regulation of the acid-alkaline balance in the body. It is necessary for the metabolism of carbohydrates, amino acids, and fats; also for energy production, and the utilization of calcium, phosphorus, sodium, and potassium. This vital mineral also helps utilize B-complex vitamins, vitamin C, and vitamin E.l.
Additionally, I recommend Curcumin, which provides powerful support for maintaining a healthy inflammatory response, promoting cellular health, and supporting healthy liver, colon, and musculoskeletal function. Curcumin Absorb is a highly bioavailable curcuminoid formulation. It contains a unique combination of three bioactive, health-promoting curcuminoids: curcumin, bisdemethoxy curcumin and demethoxy curcumin, along with turmeric oil. Although the liver support protocol is generally well tolerated by 80% of people who utilize it, some people may experience symptoms that may appear to be an adverse reaction to the liver support supplements. However, since removing caffeine and processed foods — which can result in detox and withdrawal symptoms — is part of the protocol, this may well be what they are actually experiencing. Headaches, fatigue, breakouts, nausea, and changes in bowel function are some withdrawal symptoms to expect. These should not be really painful, however, they should be more or less well tolerated and the effects should peak around day 3. After that, most people will feel better. About 65% of people actually report positive things such as feeling lighter, being less inflamed, being less reactive to a variety of substances, and having more energy, within the first week or so! However, when I see clients with intolerable symptoms that may still persist after the first 3 days, this is a sign that they may have to dig deeper for the reason why they’re not getting rid of toxins properly. There are many factors to consider when looking for the root cause of your liver support side effects. Perhaps you are also implementing a few other major lifestyle changes while getting your thyroid health back on track. Have you recently started following a new diet such as the Root Cause Intro Diet recommended in Hashimoto’s Protocol, which restricts certain foods like caffeinated drinks and processed foods? You may also experience withdrawal symptoms if you’re reducing your sugar intake. I personally experienced headaches, irritability, unusual vaginal discharge, and lethargy for about two weeks after kicking my sugar habit cold turkey. Likewise, if you’ve recently cut out gluten or dairy (common dietary Hashimoto’s triggers) from your diet, you may also experience various “withdrawal” symptoms! It has been hypothesized that when gluten is digested, opioid peptides called gluteomorphins are released into the gastrointestinal tract and taken up into the bloodstream. These peptides are considered exorphins, as they have morphine-like effects on the brain. In other words, they can have “addictive” properties, so suddenly cutting gluten out of your diet can cause strong withdrawal symptoms. Similarly, casomorphins, which are ingested via the consumption of milk products, have been suggested to cause similar withdrawal symptoms when removed from the diet. As such, a sudden removal of gluten and dairy products from your diet may trigger some discomfort similar to that of liver support side effects. If you’ve already been gluten, dairy, sugar, and caffeine free and still react to liver support, there’s a chance a nutrient deficiency may be to blame. In my experience, the main reason why people have an adverse reaction, and only about 5% of people do, is because of magnesium deficiency. If you are irritated, anxious, experience insomnia, menstrual cramps, leg cramps, pain or constipation, you are likely magnesium deficient. Taking a magnesium citrate supplement can help tremendously. Most importantly, the citrate version of magnesium has a slight laxative effect, making sure we are clearing our bowels properly and not recirculating the toxins. Interestingly, magnesium becomes depleted as toxins begin to leave the body, so please note that magnesium requirements may increase while taking liver support supplements. There are lots of strategies you can implement to mitigate the side effects of detoxification with the help of supplements, as well as dietary and lifestyle changes. As a deficiency in magnesium can cause unwanted side effects during a detox, I recommend taking a magnesium citrate supplement, such as the one by Pure Encapsulations, at bedtime. Please note, you should not take magnesium within 4 hours of your thyroid medications — the doses of magnesium in most supplements can lead to impaired absorption of thyroid hormones. Adding supportive foods and beverages is another thing I recommend to help mitigate detox side effects. Drinking hot lemon water first thing in the morning and throughout the day will not only support your liver’s detox pathways but also your stomach acid. Green juices are also wonderful for maintaining energy levels and the chlorophyll can help with binding toxins. You can drink hot lemon water or green juices instead of caffeine and you’ll see a marked difference in your energy levels. As I mentioned earlier, cruciferous vegetables are great greens that can help us detoxify. Please note, however, that if you find you’re sensitive to them, you may have a CBS mutation and sulfur sensitivity, which may be exacerbated by crucifers. If you suspect that this may apply to you, be sure to test for the CBS gene mutation using a genetic test like the one offered by 23andMe, as well as check out the Sulfur Toxicity Protocol in the Advanced Protocols section of Hashimoto’s Protocol! (So, there may be an explanation as to why you’ve always disliked broccoli since you were a child! ;-)) If you can tolerate them, however, they’re very helpful veggies to add to your meals as you follow the Liver Support Protocol. My goal is to empower you and encourage you that it’s definitely possible to heal from what you’ve been going through – and the first step is supporting the liver. If you’re ready to optimize your liver health, check out the Liver Protocol in my book Hashimoto’s Protocol for a list of recommended supplements. It is recommended that you use the supplements that are listed in the Liver Support Protocol chapter, such as the ones from Rootcology. This will ensure both liver pathways are properly supported and will create a foundation that will make your further interventions and protocols successful. Please note, it is important to individualize the protocols to your needs under the supervision of a functional medicine practitioner who will be part of your health care team and who will best know your personal needs. You can find our list of recommended practitioners here. Remember, what some people may experience may not be an allergic reaction to the Liver Protocol supplements, but rather a sign that there is something else going on, and you may want to check for magnesium deficiency. If you are experiencing severe symptoms that impair your ability to function or that last for more than 7 days, please discontinue the supplements and consult a medical professional who will be able to find the appropriate dosage for you. Supporting the liver may be daunting at first, but believe me, it is well worth it. You may notice a significant amount of change in a significantly short amount of time. Your body will thank you for taking action and being your own health advocate. And, you will feel much better! The word “liver” comes from the Old English word lifer, which is etymologically related to “life” — so it makes sense that the liver plays a key role in helping you restore your LIFE! Wentz I, Nowosadzka M. Hashimoto’s Thyroiditis: Lifestyle Interventions For Finding And Treating The Root Cause. ; 2013. Connett P, Beck J. The Case Against Fluoride: How Hazardous Waste Ended Up In Our Drinking Water And The Bad Science And Powerful Politics That Keep It There.. White River Junction, Vt.: Chelsea Green; 2010. De Coster S, van Larebeke N. Endocrine-Disrupting Chemicals: Associated Disorders and Mechanisms of Action. Journal of Environmental and Public Health. 2012;2012:1-52. doi:10.1155/2012/713696. Mikhailets N, Balabolkin M, Rakitin V, Danilov I. Functional state of thyroid under extended exposure to fluorides. Probl Endokrinol. 1996;42:6-9. National Research Council, Division on Earth and Life Studies. Fluoride In Drinking Water: A Scientific Review Of EPA’S Standards. Washington: National Academies Press; 2006. Fasano A. Leaky Gut and Autoimmune Diseases. Clinical Reviews in Allergy & Immunology. 2011;42(1):71-78. doi:10.1007/s12016-011-8291-x. Wentz I. Hashimoto’s Self-Management Program – Module 4: Liver Suport. Thyroid Pharmacist. 2017. Available at: https://thyroidpharmacist.com/hashimotos-self-management-program/. Accessed October 13, 2017. Greenberger P. 8. Drug allergy. Journal of Allergy and Clinical Immunology. 2006;117(2):S464-S470. doi:10.1016/j.jaci.2005.11.002. Shewry P, Hey S. Do we need to worry about eating wheat?. Nutrition Bulletin. 2016;41(1):6-13. doi:10.1111/nbu.12186. Vojdani A. The Characterization of the Repertoire of Wheat Antigens and Peptides Involved in the Humoral Immune Responses in Patients with Gluten Sensitivity and Crohn’s Disease. ISRN Allergy. 2011;2011:1-12. doi:10.5402/2011/950104. Friedmann A. Atrazine inhibition of testosterone production in rat males following peripubertal exposure. Reproductive Toxicology. 2002;16(3):275-279. doi:10.1016/s0890-6238(02)00019-9. Bajaj J. Various Possible Toxicants Involved in Thyroid Dysfunction: A Review. Journal of Clinical and Diagnostic Research. 2016. doi:10.7860/jcdr/2016/15195.7092. Sterzl I, Procházková J, Hrda P, Matucha P, Bartova J, Stejskal V. Removal of dental amalgam decreases anti-TPO and anti-Tg autoantibodies in patients with autoimmune thyroiditis. Neuro Endocrinol Lett. 2007. Peckham S, Lowery D, Spencer S. Are fluoride levels in drinking water associated with hypothyroidism prevalence in England? A large observational study of GP practice data and fluoride levels in drinking water. Journal of Epidemiology and Community Health. 2015;69(7):619-624. doi:10.1136/jech-2014-204971. I want to report something I feel is important. I ate cilantro on a regular basis for the past five or six years, because I love the taste of it. I was diagnosed with hashimotos four years ago. I read your Books and started the protocols. So I read about cilantro being very helpful with this health condition and I ate even more of it, like several times a week. But my Symptoms became even worse, despite following the protocols, especially brain fog. Four weeks ago, I was close to not even remembering my own name. Additionally, my lab results became worse, TSH went up and I was really puzzled and frustrated. I then came to read the advanced protocols and read about teeth health. So I decided to get rid of my last 3 amalgam fillings (after having some improperly removes 15 years ago and got sick afterwards). And so I searched information about this topic and found, to my very shock, that you should BY NO MEANS eat cilantro if you still have amalgam in yout mouth. It releases the mercury out of the fillings and flushes it into the body and especially brain. So I immediatly stopped eating cilantro like four weeks ago and I feel so much better now. Brain fog has lifted very much and I have far more energy. The amalgam fillings will be properly removed in the next months, so I hope this will make things better, too. Thought this might be helpful to someone. Greetings from germany and thank you very much for your books, Izabella, which encourage me to DIG DEEPER and gave me the dream of being healthy someday! Tatjana – thank you for sharing your experience! Not everyone will need every single supplement! In fact, I believe that most nutrients should come from the diet. This is why I always list food sources in the book and on the blog, for most of the nutrients, vitamins, minerals and probiotics that are depleted in Hashimoto’s. However, some may require/prefer supplements and the supplements on the website are a resource for those that do. I recommend getting tested for deficiencies to determine your need for a supplement as instructed in the book and blog. I also don’t recommend starting multiple supplements all at once. I recommend starting one at a time and then adding another a week or so later once it has been confirmed that the first supplement is not causing any harm. I can’t sweat and it’s wreaking havoc in my life via heat intolerance. I’ve been on .125 Levothyroxin for years. And that’s wreaking havoc with osteoporosis! Broken shoulder, broken foot and hand so far. I have no gallbladder. Is there any hope for me if I do the Liver Support? Lynda – thank you for reaching out. 🙂 For questions pertaining to the protocols please contact my team at info@thyroidpharmacist.com and they will be happy to help you. Your information is great and I appreciate it all. One problem is that it would appear only the rich can get well! There is no way a person on limited income can afford the supplements. I only have a pension and can’t afford a place of my own so live with family members. Is there any way you can cut to the quick and list only the best things for liver support. I am on 75 mg Armour for low thyroid. With the meds I now rarely get the anxiety and panic attacks. I also take Adrenal support recommended by a health practitioner. But sleep is still a problem and I’ve tried it all ~! L-Glutamine taken early morning helps with fatigue. I search for sales on supplements. Hello Dr. Wentz! First I would like to say thank you soooo much for developing the liver support protocol! It has made an enormous difference in my health. I felt a huge improvement just 2 days into starting the protocol. It felt like I was finally hitting a nail on the head with this treatment. I had been following the AIP diet for 4 months when I started doing liver support supplements too. I’ve been on this protocol for about a month now and tried stopping a couple of times because the recommendation was to do it for 2 weeks. Unfortunately I find that I go straight back to being 50% bedridden after a couple days without the supplements whereas my inflamation goes way down and I feel fairy decent and functional on the supplements. My diet is squeaky clean and I eliminated as many environmental toxins as I could think of. I’m interested to learn more about how toxins are stored in fat if not properly eliminated from the body. What’s a good book or online resource to read more about that? The last couple days I’ve developed some light muscle twitching even though I’ve been taking 300mg magnesium before bed. Could it be that I am not getting enough magnesium still? Twitching is not something I had issues with before aside from after-exercise muscle twitching. Thank you for this very informative article. I have Hashimoto and read that I should avoid all ferments, as well, I have read that they are ok. Please correct this confusion. Robin I’ve found that supplementing with probiotics and eating fermented foods can be very helpful in restoring the gut microbiome. You might also appreciate page 198 of my new book Hashimoto’s Protocol which discusses probiotics in more detail. Janelle – thank you for reaching out. I highly recommend that you work with a functional medicine clinician. It’s an entire medical specialty dedicated to finding and treating underlying causes and prevention of serious chronic disease rather than disease symptoms. We who have more than one autoimmune disease what should we do? I’ve got Hashimoto, treated with Levaxin 175 mcg, and Autoimmune Hepatitis, treated with Azatioprin 150 mgs and Prednisolon 5 mgs. Should I follow your liverprotocol from Paleo Approach? Bjorn – thank you for following this page. While I only work with patients with Hashimoto’s, oftentimes patients will have additional autoimmune conditions. Most autoimmune conditions have common root causes, and a lot of times the things that are recommended for one autoimmune condition will help with others. Conditions that I have found to respond really well to the Hashimoto’s protocols have been rheumatoid arthritis, lupus, Celiac disease, irritable bowel syndrome, eczema, asthma, Graves’, premature ovarian failure, psoriasis, Alopecia Areata, and Sjogrens. I have also seen the protocols help with Fibromyalgia, chronic fatigue syndrome, PCOS, as well as Type 2 diabetes, Crohn’s, and Ulcerative colitis. My liver enzyme GTT is 4.9 Is it safe to do the Liver Support Protocol on Page 143 of your book. I have bought all the 7 types of supplement stated. I would also like to know HOW MUCH of the MTHFR support supplement must I consume. It is not stated in your book. I am worried sick. Please kindly advise. I am from Malaysia and my son who is working in USA bought all the products for me. Hi Izabella. Thank you for all the information and the healing protocol. I just want to put out there that for others that my start suffering with migraines or migraine with aura. About 2 years ago I was put on a protocol with l-glutamate powder and also a protein powder. I didn’t know at the time but I started getting severe migraine with aura and sometimes it felt like I was having a stroke from these migraines. After 2 years and debilitating symptoms It came to light that any l-glutamate, l-glutamine or msg will cause me to get these migraines. As I have completely eliminated any glutamate powders, protein powders( whey and pea) and protein bars, the migraines have completely gone away. I have done a lot of research and these substances not only can cause migraines but also seizures in some people. As of today, I haven’t had a migraine with aura in seven months after eliminating these things. I know every body is different and I wanted to share this experience with you and others just in case someone else is having this problem. Thank you! You mention in the article that toxins are stored in fat cells if not properly eliminated from the body. What book or resaurce can we read to learn more about this? Thanks. Dear Izabella, thank you so much for doing everything in your power, to help all of us suffering from Hypothyroidism! I had a partial thyroidectomy done in 2006 (15 years old at the time), because of a cyst/nodule which I could feel when touching my neck. Fast forward to now, I feel aweful! So fatique, can't concentrate, have brain fog, bad skin and pure memory. I mostly feel like I have been run over by a truck during the morning and day, and then I gradually get more energy during the evening. And my antibodies-test was negative. Do you think my diet/lifestyle is even the problem? I eat mostly unprocessed food and get lots of carbs, protein and fat. When I dont have hashimotos, is it then even possible to get better with diet, or do you think its just low because the remaining part of my thyroid can't do the job all alone? Will levothyroxine be the key? Or NDT? I'm so afraid it will "kill" my thyroid or just make it worse, or make me gain weight, instead og helping me? I'm skinny now: 174cm and 58 kg. Even though I eat more than 2000 calories a day. I have done SO much research on this subject for years, but most of it seems to be targeted people suffering from Hashimotos. But I tried a lot of it anyway, like going glutenfree, dairyfree and so on, which seems to just have made things worse. But of course I'm also wondering why I got the cyst in the first place at such a young age. Could the antibodies-test be false? I wish you a wonderful day, Izabella! Katharina – thank you for reaching out. Adrenal imbalances are very common in Hashimoto’s patients. Treating hypothyroidism without treating the adrenals is one of the biggest reasons people continue to feel exhausted despite receiving treatment with thyroid hormones. Stress seems to be a precursor to hypothyroidism. Additionally, taking thyroid hormones can actually help us clear out our adrenal hormones faster, which then leads to adrenal fatigue. So, it’s a complicated relationship that has a lot of back and forth. You can recover and regain your health! My new book Hashimoto’s Protocol is a step by step guide to the interventions that helped 80% of the people 80% of the time. I hope you check it out. I really appreciated this article!! I have RA and Hashimoto’s and even with working with a functional medicine dr I am still really struggling to find the root cause (or causes!). I just started a similar liver detox this week and this article makes me feel encouraged that I am on the right track and that I am not the only one suffering with these issues (I feel like my body hates everything!). Suzy – thank you for following this page. While I only work with patients with Hashimoto’s, oftentimes patients will have additional autoimmune conditions. Most autoimmune conditions have common root causes, and a lot of times the things that are recommended for one autoimmune condition will help with others. Conditions that I have found to respond really well to the Hashimoto’s protocols have been rheumatoid arthritis, lupus, Celiac disease, irritable bowel syndrome, eczema, asthma, Graves’, premature ovarian failure, psoriasis, Alopecia Areata, and Sjogrens. I have also seen the protocols help with Fibromyalgia, chronic fatigue syndrome, PCOS, as well as Type 2 diabetes, Crohn’s, and Ulcerative colitis. In Hashimoto’s Protocol, it says we are supposed to use NAC for Liver Support (Protocol 1) and Gut Balance (Protocol 3). Should we also take it in during the Adrenal Recovery (Protocol 2) or leave it out? Thank you! What do you think about castor oil packs for gently helping the liver detox? Jennifer – I wish I could give you more direct advice but, each person will react differently. I would advise you to ask your personal pharmacist or a trusted clinician who’s care you are under. I am not able to respond directly to these types of questions here. Is it safe to use Liver Support Supplements while pregnant? Are Hyperthyroidism and the liver detox related as well? Is there anything to help those of us that don’t have the under active thyroid? Cindy – thank you for your question! Graves and Hashimoto’s are both autoimmune conditions that affect the thyroid. They are thought to be closely related. Sometimes one turns into the other. The difference is the site of the antibody attack. In Hashimoto’s, the antibodies are found to thyroglobulin (in 80%) and thyroid peroxidase (TPO) enzyme (in 95% of people)-Hashimoto’s results in hypothyroidism and is usually treated with Synthroid and replacement hormone. Is it alright to drink lemon water with your thyroid hormone replacement in the morning? Will it interfere with the absorption or in any other way? Shannon – thank you for following this page. 🙂 Graves and Hashimoto’s are both autoimmune conditions that affect the thyroid. They are thought to be closely related. Sometimes one turns into the other. The difference is the site of the antibody attack. In Hashimoto’s, the antibodies are found to thyroglobulin (in 80%) and thyroid peroxidase (TPO) enzyme (in 95% of people)-Hashimoto’s results in hypothyroidism and is usually treated with Synthroid and replacement hormone. I noticed in the liver support supplements that some of the ingredients overlap. Is this Okay? Don’t want to over do it. Do you recommend starting all these supplements at once or slowly introduce each? Thanks Izabella. I followed your Root Cause book and it helped me to bring all my thyroid levels into normal range while reducing my antibodies. I read your book so many times and continually reference it. Appreciate all your knowledge and guidance ! Dani – thank you for your support! For questions pertaining to the supplements please contact my team at info@thyroidpharmacist.com and they will be happy to help you. I also don’t recommend starting multiple supplements all at once. I recommend starting one at a time, and then adding another a week or so later once it has been confirmed that the first supplement is not causing any harm. I am in a terrible state. I can’t follow so many of the prescribed supplement options and food choices due to gastritis and IC and it’s extremely frustrating. But I’ve worked hard at optimizing everything else yet don’t appear to be getting anywhere. I can’t lose fat, keep my hair from falling out and thinning away, or save my skin from constant reactions from meds. I’ve got skin that’s all dried up and sagging off like I am 80 years old. I am a 54 year old female almost through menopause and it is destroying every part of me–hair loss, fat gain, total loss of elasticity of skin, etc. etc. And I can’t treat thyroid w/the meds I’ve tried as I react to all of them in the same way..horrible acne and a bright red face! I wonder what is someone plagued with sensitivities like mine supposed to do? I’ve seen so many columns advising things like lemon water or apple cider vinegar for example. I can’t go near a lemon or anything acidic or it will cause a severe gastritis attack and cause bladder pain. I can’t digest any supplement in a capsule because it provokes a severe gastritis attack. It has been DECADES since I ate a SAD diet, and I do not have Hashimoto’s. But I do have subclinical hypothyroidism that is likely due to estrogen dominance. I avoid sugar, all processed foods, gave up gluten six months ago, eat only good fats, no fast foods ever, nothing fried, just mostly fresh. Fruits, veggies, organic chicken and turkey. No red meat. I still eat dairy and no more than 2 cups of coffee in am each day. Those are the only offenders left but I find it hard to believe they’ve got anything to do with my symptoms. When I learned from a Nutra Eval comprehensive test that I have high levels of mercury in my blood, I gave up tuna which I had only started eating in the last year. Before that I was a lacto-vegetarian for 14 years. I tried three different types of thryoid meds, two synthetic including generic levothyroxine and Synthroid, and Armour and all of them gave me severe acne and a red face that takes months to clear up. All of this on the smallest dose once a day every morning over a hour before food. I exercise on the treadmill, was doing 6x a week for 40 minutes a day, do light weight lifting for every part of me, and I still am exactly the same, as shapeless and “fat” as I was before I began. But I’ve only gained eight pounds in the last 7 years and am not obese at 5’5, 138 lbs – I just LOOK obese! This all came on over the last couple years as I enter into menopause. I do not know anyone else personally who’s had such a rough time of it. My TSH is around 4.0 or higher. My T3 is 2.2. My T4 is .98. I am estrogen dominant and progesterone deficient. I am working with a functional medical dr. right now… some nutrient deficiencies were found in my comprehensive tests. I can’t lose fat, my body shape is totally distorted with excess fat on my thighs, stomach, and hips, my skin sags and everything looks horrible. I lost 1/2 of my formerly thick head of hair almost 4 years ago. What’s left is a thin dried up mess. I am 54 and not yet through menopause. I can’t take another day of this. Is there any hope for someone like me? I am following up with the holistic dr. in a few days and my strategy will be to forego all thyroid meds altogether and instead try to treat the estrogen dominance as it is likely the root cause. Thanks for your excellent blogs!!!!!! Hi. I have your book and was just reading about Lush products this morning. They are available in France where I live so I was wondering if you recommend them. Thanks in advance. Christina – thank you so much for reaching out. Conventional cosmetics, potions, and lotions are filled with petroleum by-products, phthalates, formaldehyde, hormone disruptors and other toxins. As a pharmacologist, I’m well aware that what you put on your skin definitely gets absorbed into your body! Here is an article you might find helpful. You can also search http://www.ewg.org/skindeep/search.php to see how your products compare. I was told to take NAC 3x a week with food by my doctor for liver detox (although my numbers are great). Is this a bad idea? Also I later read on a Hashi’s page that it should be taken with Vitamin C and should not be used if you have silver fillings. What are you thoughts on this? Finally, the day I take it I feel like one person, highly motivated, positive, almost too much energy, then a day or two later I am exhausted. This doesn’t seem to be safe and if this is what is happening, what would be the underlying cause to this? I don’t want to take a pill if I don’t need it or if it will cause long range damage. My energy level was completely stable before I took it. Lisa – thank you for reaching out and sharing. <3 I wish I could give you more direct advice but, each person will react differently. I would recommend that you discuss this with your trusted clinician who’s care you are under. I posted a comment here a week ago but it’s disappeared, it doesn’t even say awaiting moderation, it’s been removed. Why is this? It was in no way inappropriate, I just asked some questions, even if it was slightly longwinded. Why has this happened please? This has also happened in another article where I made some posts. I’ve recently bought your second book, and I’m wondering if the intention is that one should aim to stay off the foods in the liver protocol after it ends (gluten, dairy, etc)? Or is it the intention that they can be added back after the two weeks?